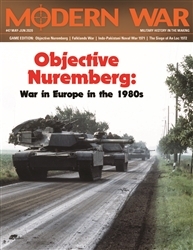 Objective Nuremberg is the first volume of what will grow to be a series of games, the 7 Days to the Rhine series. Each subsequent single-volume game will use the same system and will be playable alone or mated to other games in the series, with the eventual goal being a mega-monster game covering the geographic entirety of this war across the whole East German and Czechoslovakian border areas. Each hexagon on the map represents 2.5 miles (four kilometers) from side to opposite side. 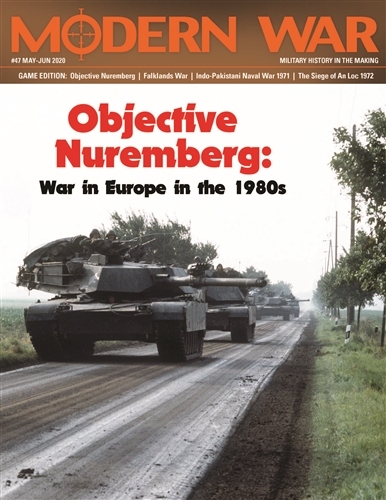 The Warsaw Pact regiments, while the units of maneuver on the NATO side are battalions. 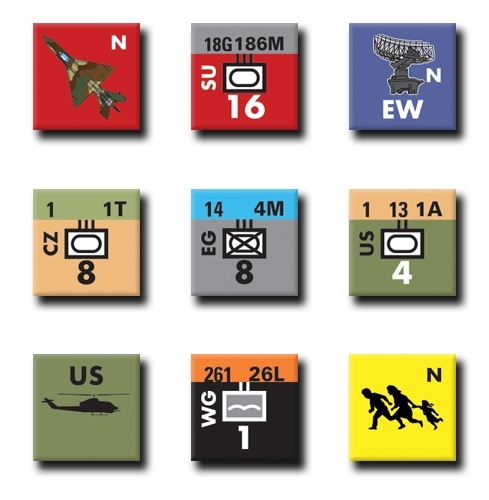 Air power and electronic warfare are represented abstractly, with counters and rules showing the effects of one side or the other gaining temporary superiority within those sub-realms of conflict. Each day is made up of one nighttime and two daylight turns. Counter sheet shows a late model Blackhawk, not around until mid 80s. I hope you use accurate artwork.